A music file player for Linux, Unix, DOS and Windows 95-ME, XP. 2009-08-06 I have tried for years to turn off the old GeoCities homepage, which wasn't maintained since 2002, but without success. As Yahoo will shut down GeoCities on 2009-10-26 they will finally take care of this issue. However when thinking about this, I thought to preserve this historic document, so I have made a copy on our servers for you to enjoy. I have only made slight changes to update broken links and email adresses. And you could ask the Wayback Machine for even more historic versions. 2006-12-14 We decided to officially declare the DOS version of OCP dead. Development has stalled for about 5 years. The program will be available for download, but don't expect any updates to this program anymore. Meanwhile the UN*X/Linux port has made a huge progress and is now the current development tree. 2004-12-27 10 years of Open Cubic Player! At The Party 1994 the first version of OCP (0.9) was released which supported the SoundBlaster family of cards (at that time: SB, SB Pro, SB16). Now ten years later you are still able to use OCP on a variety of operating systems, starting with DOS, going to Windows and via Linux to several others as well. Have a look at the Running page for details. 2004-03-16 Added the tga2wav program to the download page. 2002-01-02 The 2.6.0pre6 version is released and should work with DirectX. 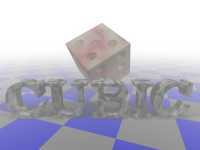 2001-11-07 OpenCubicPlayer 2.6.0pre5 is released. The only difference to the previous version is the fixed DirectX driver cphost.exe, which should work now with DirectX 7 and later.